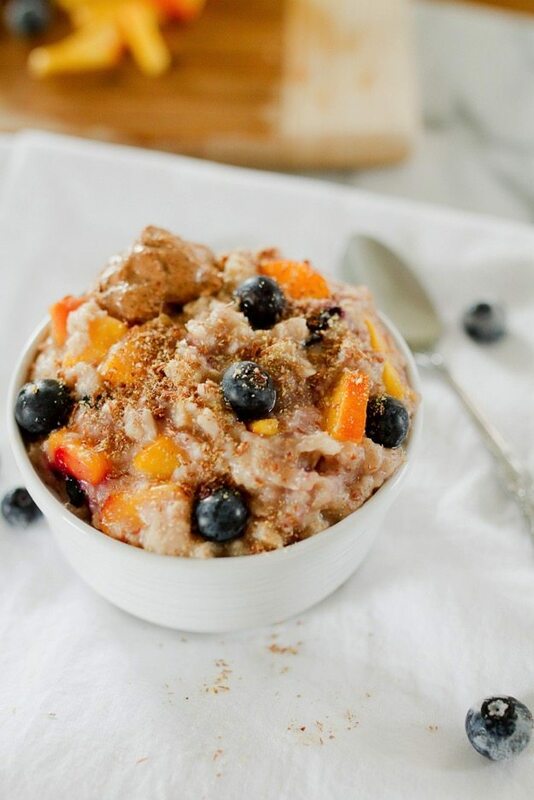 Add fresh peaches and blueberries to your oats for a healthy and flavorful bowl of blueberry peach oatmeal. 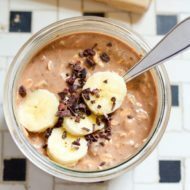 Loaded with fiber, healthy fat and protein this delicious bowl of oats will keep you feeling full and energized all morning. I know oatmeal isn’t very summery, but blueberry and peaches are in season and for whatever reason I was craving a big bowl of oats the other morning. So yeah, I was kind of sweating a little bit while eating this BUT it was totally worth it. Next time (i.e. tomorrow) I’m just going to crank the air conditioning while I eat breakfast so that doesn’t happen. Speaking of — is it just me or is it impossible for an establishment (house, office building, store, etc.) to feel comfortable in the summer? It’s either too hot because the air conditioning isn’t running or the air conditioning is blasting and it’s so stinkin’ cold you have to wear a sweater. First world problems, I know. But it’s still hard to deal. Okay, so back to these oats. They’re just regular rolled oats, cooked on the stove top but spruced up with some local summer goodness. Isaac hand-picked the blueberries at a local farm and we got the peaches from the farmer’s market last weekend. Hooray for local produce! 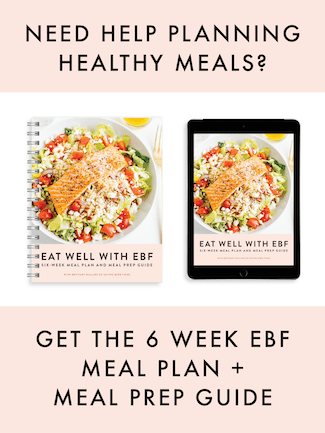 The oats are topped with a hefty sprinkle of ground flax and a spoonful of almond butter for good measure. <– Serving oats without nut butter is basically a crime. 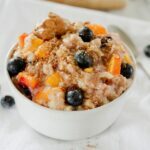 The fresh peaches and berries add a subtle sweetness, but these oats aren’t overly sweet like most packaged oats. 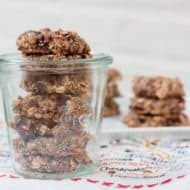 If you’re in the mood for something a tad sweeter, feel free add a little stevia or natural sugar to the oats or a drizzle a bit of maple syrup or honey on top. 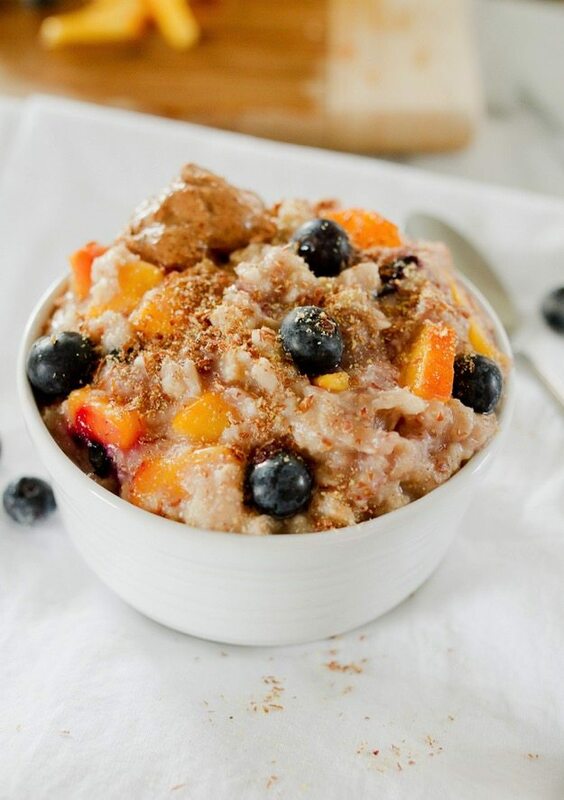 Add fresh peaches and blueberries to your oatmeal for a healthy and flavorful breakfast. Loaded with fiber, healthy fat and protein this delicious bowl of oats will keep you feeling full and energized all morning. Add oatmeal, water, 1/2 cup peaches, 1/4 cup blueberries, vanilla and cinnamon into a small saucepan. Spoon into a serving bowl. Top with remaining peaches, blueberries, ground flaxseed and nut butter. Enjoy! Fresh peaches and blueberries work great during the summer, but feel free to use frozen fruit in the winter. Just thaw the fruit and follow the recipe as normal. It is absolutely a fact that buildings cannot provide the perfect comfort level in the summer. And that oatmeal looks t-oat-ally awesome! YEEESS! I love how drippy sunbutter is. Yum, everything about this breakfast looks absolutely incredible! I love all the ingredients, the color, everything! I will definitely be making this soon! Oh wow this looks absolutely fabulous! Yum! My kind of oatmeal! Love peaches & blueberries together. Oooh this looks amazing! What a delicious way to start the day! I’ve been loving fresh peaches lately! I haven’t combined them with blueberries yet though! 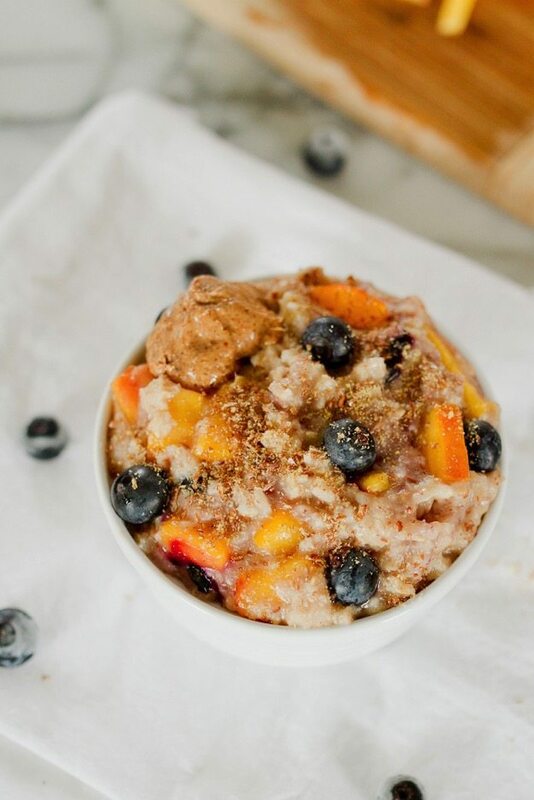 I love the blueberry and peach combination, I have been recently making it for breakfast with my millet porridge. :) I will try your recipe as well. Thanks for sharing. Yes! Hooray for local produce!!! Love peaches and blueberries together, Brittany. The bomb! This looks like a great way to start the day! I’m terrible about breakfast but I know I need to get better! This looks delicious! I feel like these could be adapted to an overnight oat recipe, with some tweaking. You could even cook down the blueberries and peaches with a little stevia to make it like a pie filling, which could be tasty! 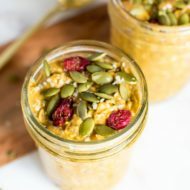 I eat Old Fashioned Oats most days, I tried this recipe this morning and loved it.